See below for details of latest events in Northern Ireland. 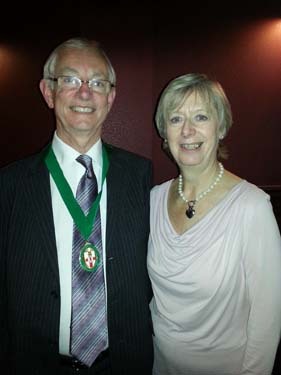 Portadown Society meets at the Town Hall usually on the first Friday of each month at 7:45pm. NIPS - 28th November 2015, Stamp Fair, Cadogan Road. LVPS - 2nd December 2015, AGM & Members Night, GB "Back of the Book"
BPS - 18th December 2015, AGM & Film Night. Why not come along to one of these events and find out a bit more about the Society? Contact us at the address below for further details. Can the local secretaries of the various societies please send us a list of the new events for inclusion in this column? GB Special Event Postmarks Updated with 19th April 2013 cancels. BFPO - The British Forces Postal Service is now operaterd here. You can contact www.bfps.org.uk for the latest information. 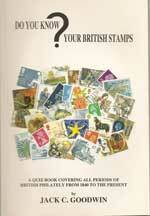 A Guide to the Basics - A new set of basic information for stamp collectors - let us know if you want to add anything. NIPS members Jon & Rosemary Perrott have published a new site on the development of the red star line postcards. This site has a wealth of information and a selection of images from the various sets of cards as published. 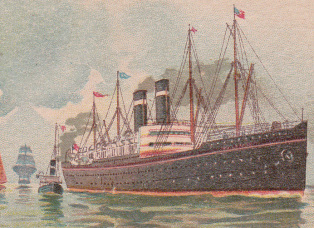 See the link at https://redstarlinepostcards.wordpress.com/ or by clicking here. 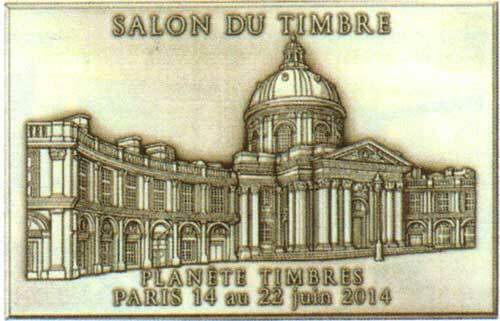 At the "Salon Planete Timbres 2014" in Paris, North of Ireland member, Me Des Quail with his collection on Irish Postal History won the first Large Gold Medal ever for an exhibitor from the island of Ireland with 95 points and Felicitations from the Jury. The exhibit was specially admired for Mr Quail's exceptional treatment and for the condition and rarity of the material. 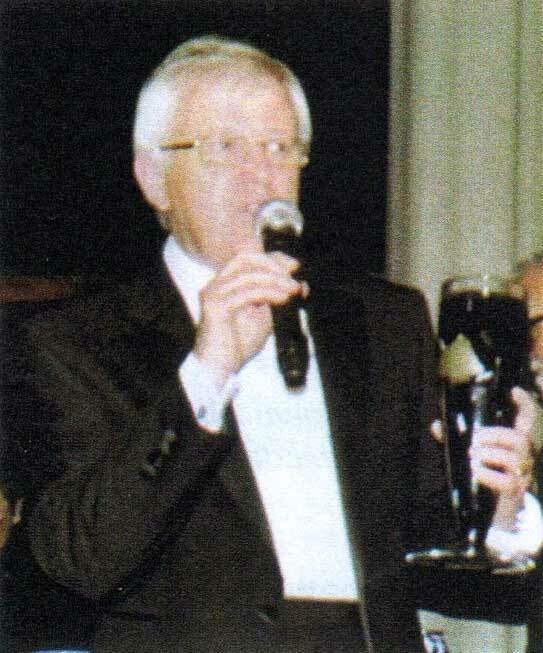 Des pictured making his acceptance speech alongside an image of the large gold medal. In December 2014 the Bangor Spectator published an article highlighting the Shoesmith Exhibition which is taking place at Bangor Museum, Town Hall, Bangor, BT20 4BT, Tel 02891 271200 from 10th December 2014 to 11th January 2015 in the community gallery. The opening lecture by Glyn Evans took place on 10th Dec 2014 in the Long Gallery. Please note the Museum is closed on Mondays. Further details of the previous dispaly at Belfast City Hall are noted below. 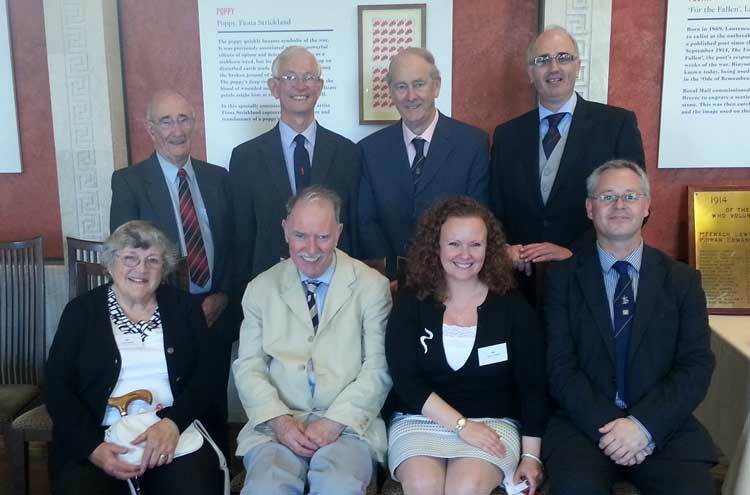 On 24th June 2014 the NIPS Committee was invited to Parliamaent Buildings at Stormont to meet the Royal Mail team and to take part in the prelaunch of the World War 1 Commemorative stamps which were launched in July 2014. Part of the Committee is pictures with Morag Turnbull from External Relations at Royal Mail with images of the new stamps in the background. 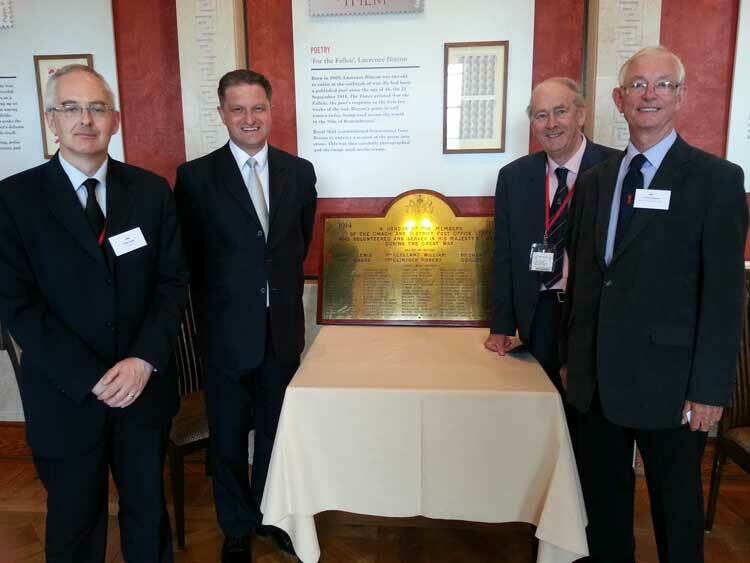 As part of the stamp launch the Commemorative plaque from the Crown Post Office at Omagh was brought along to the launch. 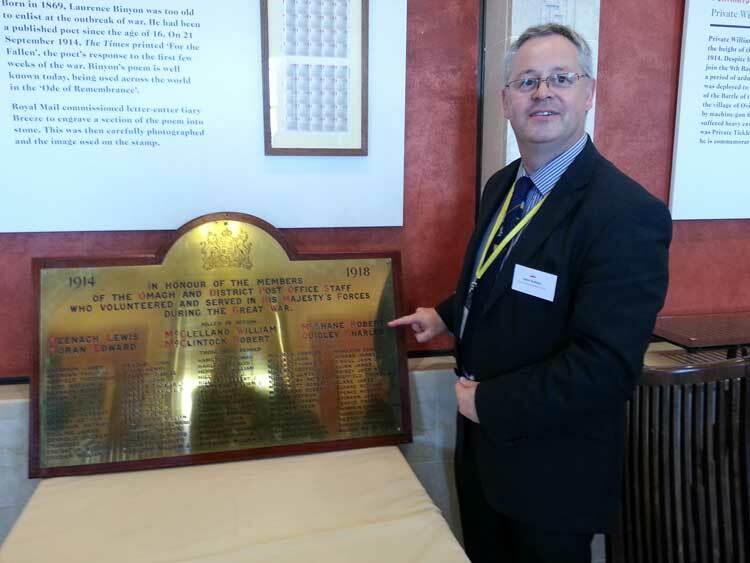 This plaque commemorates the honour of the members of Omagh and District Post Office Staff who volunteers and served in his Majesty’s Forces during the Great War 1914-1918. Six staff members were killed in action and Our Secretary spotted a name sake, Robert McShane, and has now embarked on some family research to find if there is any connection. Philip Parker from Royal Mail's stamp Strategy Department with our President Clifford Holmes and Vice President Jon Perrott. I can't believe it has been so long since we updated the site, and I can only say that it has been due to pressure at work, keeping me from our hobby. 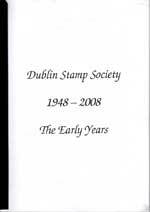 I attended the joint Dublin Stamp Society / Portadown Society meeting in Dundalk in May and this was a catalyst for great discussion. I agreed to add a few details to the site on various matters and will endeavour to do this over the next few weeks. A selection of the members from the various Societies that attended the meeting in May 2014 - can you spot yourself? The NI Philatelic Society hosted a display of images from post cards and covers created by Kenneth Shoesmith at Belfast City hall during the month of August 2013. Shoesmith was born in Halifax, Yorkshire and trained on HMS Conway from the age of 16, before joining the Royal Mail Company as a Junior Officer. Travelling the world on the ships between duties he would paint the maritime scenes and ships upon which he travelled. 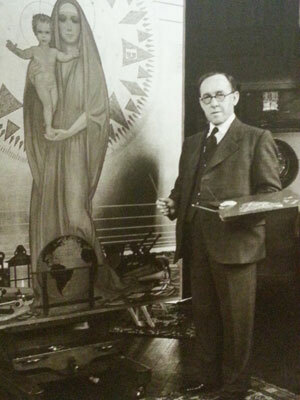 In 1936 he painted the murals for the liner Queen Mary. This display is mainly from cards held by John Finlay of the Society and is seen as complimentary to the current exhibition of his art work at the Ulster Museum. New Northern Ireland Slogan Postmark, more details here for 2013 and here for 2014. Updated Dec 2014. There have been reports of a new Northern Ireland Slogan Postmark for the Christmas Stamps to celebrate the winners of the design a Christmas 2013 stamp. The campaign started on 3 October, with each postmark being in use for one day only running up to the announcement of the two winners on 31 October, and the issuing of the stamps on 5 November. However I have yet to see any examples of the Northern Ireland slogans which are reported to have been used on 10th and 11th October 2013. Does anyone have any? Examples reported are :-Nial Conn from Armagh and Corin McCrea from Holywood. The above example shows a Congratualtions to Rosie Hargreaves from the Northern Ireland Mail Centre, has anyone received others? A few people have asked me if I have seen a copy of the Happy St. Patrick's Day Slogan used on 14th March 2014. Above is a copy couresy of JB showing use from machine number 2 on teh 39th half hout period. I also couldn't let the Giro Italia pass without showing a copy of the Slogan in use during the cycling event. This example arrived in the post dated 2nd May 2014 from machine Number 1 and is the earliest I have seen so far. I will list details of the various machines when I get time. Out of 40 covers sent only about 12 received the Slogan. 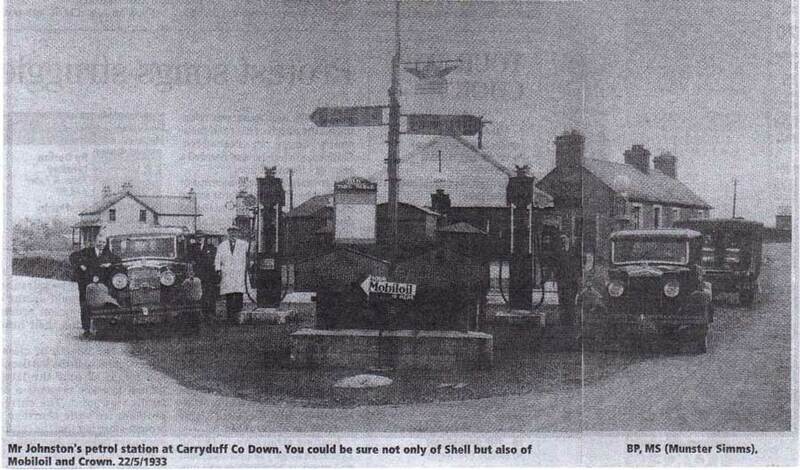 One of our members passed me this photo of Carryduff Post Office from 1933. I have added it to the Carryduff page. February - Spinning A Yarn Display, Here. March - Fair dates added and postmarks as per update list below. Dr Who Added. The next NIPS meeting will be held at McCracken Memorial Church Hall, Malone Road on Friday 9th January 2015 and will be a presentation by Gold Medal Winner Des Quail with a new selection of Postcards for Postcard Night. Please come along from 7:00PM. PLEASE NOTE THE NEW VENUE FOR THE NORTH OF IRELAND MEETING. ALL OTHER SOCIETIES WILL CONTINUE TO MEET AS BEFORE. THERE IS NO MEETING IN JULY. Can the Secretaries of the local Societies please email me with details of the latest programmes for 2015 so that the meetings can be added to the event list. The December 2014 meeting was held at McCracken Memorial Church Hall on Friday 12th December 2013 when a display of 40 sheets was given by Norman Scott on the topic of War Covers. Over the years the society has released commemorative postcards on the day of the Annual Fair. The 2013 fair sees the introduction of a new card following a few years without one. 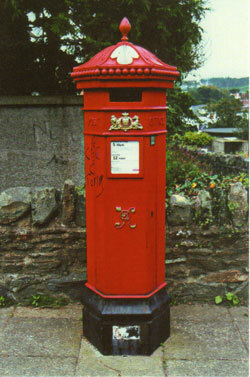 It depicts an Hexagonal Acanthus Top VR post box as located opposite the old Jail at English Street in Downpatrick, County Down. Copies of the post card are available at 50p or at £1.25 with a first day of issue cancel, plus £1 postage and packaging. Contact us on the email address in the left margin below with reference NIPS 2013 Postcard. Details of the previous cards are available here. The Society operates a Library for members. Over the coming months we will add a members' area to the site with a list of the books that are available for short term loan. In this Section we will add details of the latest Catalogues or Reference Books added to the Library. While attending one of our local meetings a fellow member highlighted the illustrated five pence stamp from New South Wales. We noted on the back what appears to be a large OS Watermark. Could this be from the word POSTAGE? and if so, was this type of paper used for printing stamps in NSW? If any one can tell us anymore we would be grateful to receive an email. An email from our colleagues in Australia confirms that this stamp is probably from the top of the sheet with the watermark POSTAGE misplaced on to the first row of stamps. If you have a counter view, let us know. 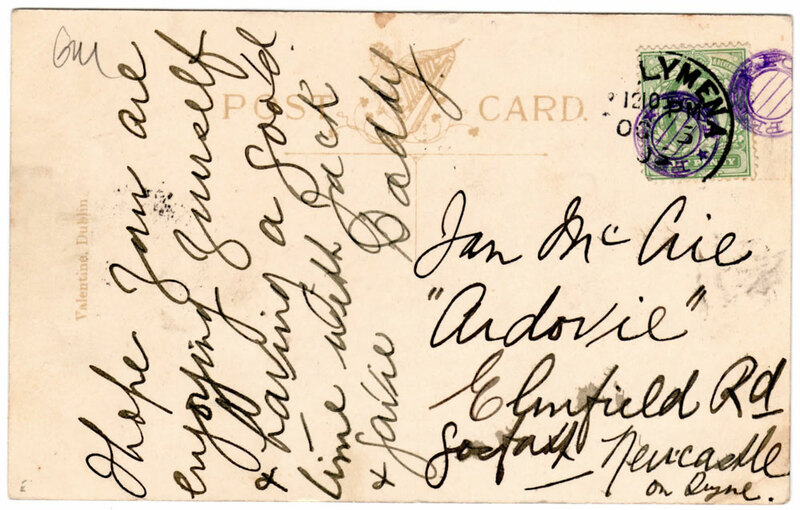 The postcard to the right was posted in October 1904 from Ballymena to Newcastle on Tyne. The Ballymena cancel is only partially struck but is tied to the card by the 12.10PM time and Oct date. However the two purple circles are an unknown to us. They measure as a double ring with diameters of 8mm and 15mm. There is a star at the base on two sides and what looks like PE?? POST although this isn't clear. The centre of the circle is shaded with 3 diagonal purple lines. Can any one tell us the source of this mark? The latest debate is that this is from a toy post office with a child having cancelled the stamps, any further thoughts? While catching up on some research recently into the historic proposals for the Irish Channel Tunnel I had call to read the Northern Whig from 1886. I came across a set of interesting letters relating to the Post Office in Belfast. The first was in the edition of 31st July 1886 which discussed the official visit at the pre opening of the new Post Office in Royal Avenue. The letter refers to the official opening for business tomorrow (Sunday 1st August 1886). The article gives a list of the various dignitaries attending the private viewing including the Mayor of Belfast, Sir E. J. Harland and a number of MP's including William Ewart Esq. The second article appeared in the Northern Whig on 4th August 1886 and was a letter from John McCann, 39, Victoria Street, Belfast complaining about the need to climb 17 steps to post a letter. It also gives a summary of the key people instrumental in securing the new post office for Belfast. The Federation of Northern Ireland Stamp Societies held an Exhibition at Bangor Museum, Castle Park, Bangor, BT20 4BT between Tuesday 25th October 2011 and Friday 4th November 2011. Further details are available here. The 2015 Auction will be held on 12th November 2015 at St. Nicholas Church Hall, Lisburn Road, Belfast, at 7pm. Please let us know if you would like to participate in an Auction next year. The Auction list has been saved as an adobe PDF file and can be downloaded by clicking here. Alternatively a Word text document can be downloaded by clicking here. 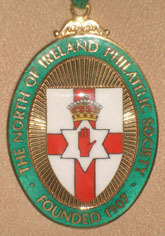 The 2013 Annual Exhibition and Fair will take place at St. Nicholas Church Hall, Lisburn Road, Belfast, on Saturday 13th April 2013 from circa 0930. Please pout this date in your diary. Do You Have Any Interesting Articles? If you are carrying out any research and want to have it available to others, or do you have any interesting covers or photographs that you would like to share with us. If so please email me with details and I will add it to the next update. A number of members have suggested adding a section for 'Wants'. I have added a new page to cover this suggestion, all I need now is for everyone to email me with their requirements, a contact address and I will happily act as a mail box to forward details of your requests. Try this link for a starter. Here. 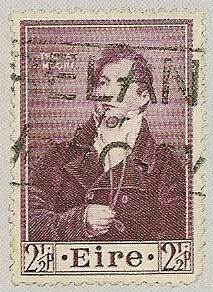 The 2½d Thomas Moore stamp normally carries a multiple 'e' watermark. 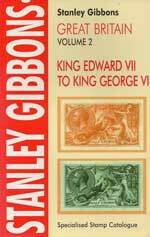 Stanley Gibbons report in the January 2011 edition of a find from Mr B Strandley of an inverted multiple 'e' watermark. The new variety is to be listed in the 2012 catalogue as SG152w. This has not been listed in the 2010 Hibernian Catalogue. 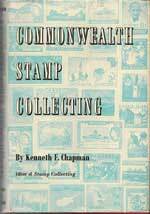 The stamp was printed in sheets of 120 divided into two panes of 60, so have a look at your stock book and see if you have any of the other 119. In other news David MacDonnell reports the discovery of the SG32 Thom Overprint 'Rialtar' 1½d, with Royal Cypher Watermark inverted and reversed. 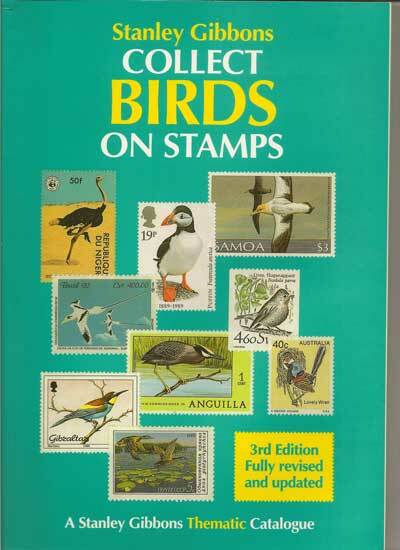 The used stamp will also be added to the SG Catalogue as SG32y. This Space has been reserved for your next article - please drop us an email or hard copy at one of the next Society meetings. Please do contact us and let us know your thoughts on the website. The full list of the Irish Post Offices can be found here. 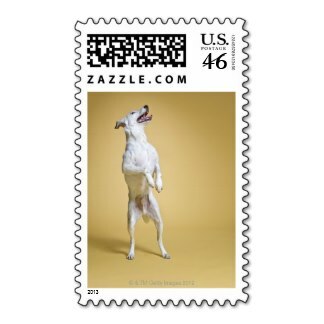 This is a list of over 2000 post offices and does take some time to download. Over time we will extract it into smaller files as the information is completed. 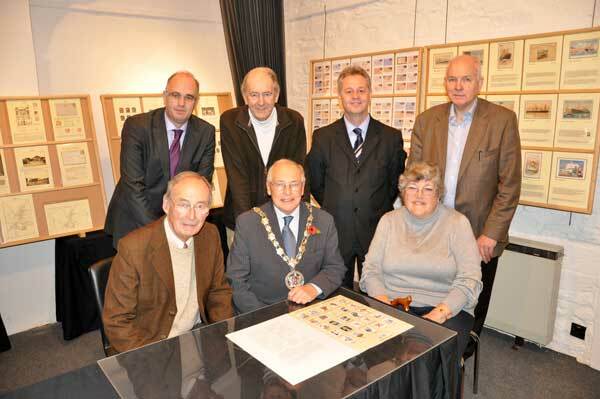 The Federation of Northern Ireland Philatelic Societies held a display at the North Down Museum between 25th October to 4th November 2011. Pictured above are some of the members taking part in the display, including Stuart Tanner, Jon Perrott, Kevin McShane, Errol Dunne, Front, Robert Tenney, Bangor Mayor James McKerrow and Carole Barbosa. The event was officially opened by the Mayor of Bangor and its visitors have included local collectors, overseas visitors and the Mongolian Consulate in Northern Ireland. If you need further details of this event held in Bangor please click the link here. 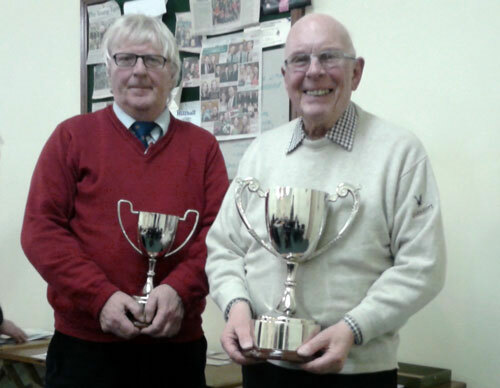 The Annual General Meeting for Lagan Valley Philatelic Society was held recently and the awards for the annual competitions were presented to Ian Herron for the best thematic display and to John Finlay for the best display presented to the Society in the previous year. August 2011 - Ship Letter to London. 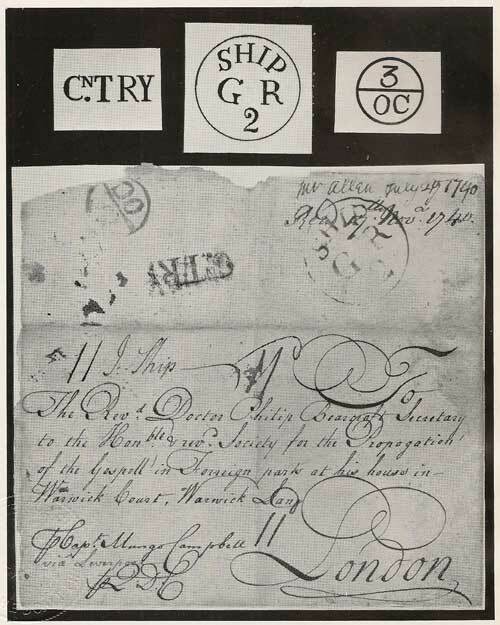 The 1740 Ship Letter was published by Alan Robertson as the only known example of a Circular Ship mark from Ireland. The mark contained within a 30mm single circle reads SHIP / GR / 2. The cover to the left shows an Irish Bishop mark for 3 OC and an abbreviated "CTRY" Country handstamp. When the article was written in 1954 further information was sought. Does anyone have any further examples of this or further information, if so let me know. Be warned I am on the look out for further images for August so be prepared! Previous covers of the month for 2010 can be viewed by clicking here 2010 and a new Cover of the Month page has been set up for 2011. If you have any questions or covers for next month please do email me with details. If you have any comments or items that you would like added please do email us. Latest Updates are Noted Below. To access these click on the highlighted text. Do you have a cover or story for the January cover of the month? - if so please let me know. 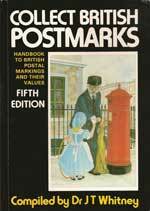 I am also on the look out for copies of slogan postmarks, so please keep me any envelopes you receive and no longer require, to assist in this research. 7 Dec 2013 - Programme updated, photos of annual dinner added and additional details added. 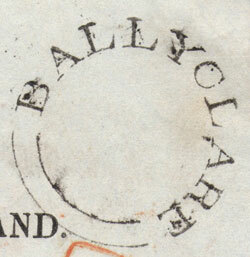 18 May 2013 - Latest GB special handstamps added & Ballyclare added to Undated Circles. 24 Apr 2013 - Details of Football Heroes postmarks added. Home page updated. 04 Apr 2013 - Details of new 2013 Postcard added. 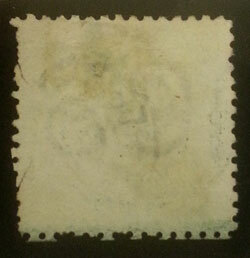 02 Apr 2013 - Great Britons Postmarks added. 17 Mar 2013 - Happy St Patrick's Day from Ireland! 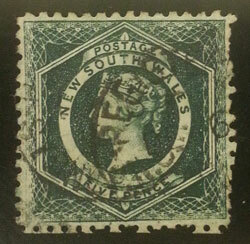 New South Wales item added. 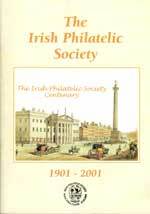 Update to events added for Belfast Philatelic Society. 9 Mar 2013 - Naas Post Office added. Irish Undated Circles (UDC) listing added. Wexford Town Postmarks added. 22 Feb 2013 - Nutt's Corner Postmark Added. 22 Jan 2013 - Update postmarks for Jan 2013 added, here. 24 July 2012 - Special May Postmarks added, here. 17 Jun 2012 - Special handstamps for Charles Dickens added, here. 04 Jun 2012 - Latest News on GB Issues for Charles Dickens. GB Issue for Classic Scottish Locomotives Added. 26 Feb 2012 - GB Special Handstamps for 24 February 2012 added. 16 Feb 2012 - Pond Park Road Lisburn added to Post Marks. 12 Feb 2012 - Home Page updated, GB Special Handstamps added for 10 Feb 2012. - See GB Handstamps. Details of new issues for Diamond Jubilee and House of Windsor added. 29 Dec 2011 - Summary of Roald Dahl Handstamps for 5 Jan release. 25 Dec 2011 -A summary of County Down Post Office data added. 24 Dec 2011 - An updated selection of special handstamps added for 1979, can you fill any of the gaps? 11 Dec 2011 - Lettters from Northern Whig on new Post Office at Royal Avenue added. 27 Nov 2011 - Details of new GB Christmas Stamps added. 20 November - Home Page updated, GB Special Handstamps added for Sept to December 2011. - See GB Handstamps. 18th September - Home page updated, Brian Warren display added, details of Federation meeting added. Index updated. 20 August 2011 - A summary of Irish SHIP marks added. Do you have any more you would like to add, if so let me know. These are the general marks and more detailed marks will be added later. 14 August 2011 - New Zealand, Back of the Book, Display added. Events updated. 24 July 2011 - Home page updated with events. GB handstamps for 22 July 2011 added. 22 April 2011 - GB Special Handstamps added for Royal Wedding, 15 Apr 2011. Homepage updated. 17 March 2011 - Ballinaskeagh, Ballindarragh PO Added to list. Tullamore updated. Home Page and News Updated. 3 March 2011 - Lagan Valley Display on Zepplin Covers added. New pages started for Moss Rd, Lisburn, Portadown Station, Lisburn, Dromore Co. Down, Lenaderg and updates made to Banbridge. 20 Feb 2011 - GB Special Event Postmarks added for 18 Feb 2011. 12 Feb 2011 - Display, 'Between the Covers' added. 4 Feb 2011 - Library List Updated. Calendar Updated. Pillar Boxes 3 added to Members Displays. Home Page updated. 29 Jan 2011- Home Page updated, Latest Release of GB Special Event Postmarks added for 21 Jan 2011 and historic record for 25th June 2010. 13 Jan 2011 - Latest Release of GB Special Event Postmarks added for 7 Jan 2011. 21 Nov 2010 - Updates to Post Offices at Augher, Aughamullan, Aughafatten, Aughagallon, Ashfield. New reports for Ballee Ballymena, Ballee Downpatrick, Baillies Mills. New Special Event Christmas Postmarks for 12 Nov 2010. Members display added for Italy 1861-3. Updates or new listings for Crossgar, Doagh Road, Donaghmore, Donaghmore Co. Tyrone, Fivemiletown, Garrison, Ballinamallaght. 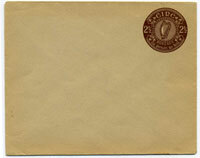 We are looking for new postmarks and pictures of Irish Post Offices. Please send us a copy of any images you have and we will add them to the database. We have started to add opening and closing dates to the Postmark index, can you help with these? This is a large page so please give it time to load. The above images represent some of the books in the library. Further details will be added to the Library list as time permits, however if you would like further information on these publications simply click on the image above and you will be redirected to further details of that book. 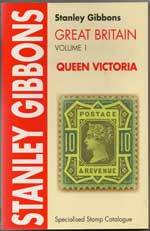 If you have read an interesting book of a philatelic subject please do send me details so that I can pass on the benefits of information to other members. If you have surplus books that you feel may be of interest to other members, please do let me know.